Guess the one guy who plays goalie among the New York Ranger prospects wanted to send a message of his own on Wednesday evening. 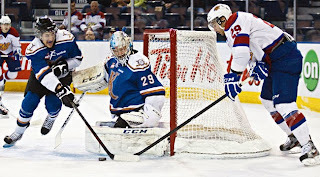 Mackenzie Skapski (NYR 2013 6th) stopped 40 out of 42 shots as his Kootenay Ice came from behind with 4 goals over the last 4:09 of the game to defeat the Medicine Hat Tigers 5-2. Skapski did what you want out of your goalie when your team just doesn't seem to have their game going which is buy some time and keep them in the game long enough to hopefully earn a win. Kootenay was just struggling trying to find offense as they could only manage 1 goal on 15 shots over the first 2 periods but Skapski shut out the Tigers stopping all 24 shots he faced. In the 3rd period the Tigers dialed up the pressure even more and eventually broke through first to tie the game and then to take a 2-1 lead with just 5 minutes remaining in regulation. But Skapski could not be faulted on either goal as Medicine was keeping the pressure up and they were crashing both the net and into Skapski. The scorers have been getting a ton of the ink as of late but Skapski has been hot on his own since January 12. 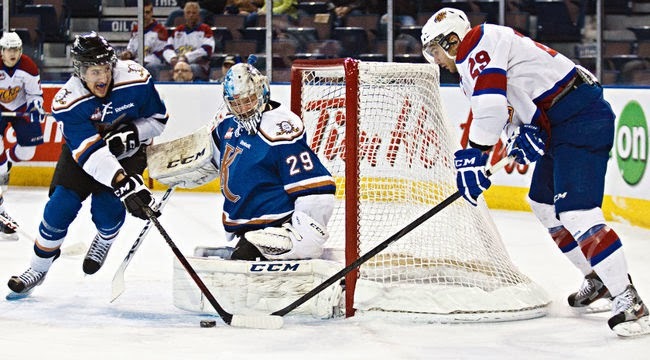 Skapski is 13-1 dropping his goals against from 2.91 to 2.63 (he is 1.87 so far this month), improving his save percentage from 0.910 to 0.920 (0.940 this month as Kootenay has jumped from 8th in the WHL's Eastern Conference to 5th and are just 3 points behind Medicine Hat now for that 4th seed. Then there is Ryan Pulock (NYI 2013 1st) and his Brandon Wheat Kings who are headed in the opposite direction from the Ice. Battered by injuries and toss in a couple of suspensions, the Wheat Kings have gone from leading the WHL's East Division to 7th place in the Eastern Conference after losing to the Victoria Royals 5-3. The loss extends the Wheat Kings winless streak to 7 games as Brandon dug themselves a 4-1 hole after the first period and couldn't recover. Pulock tried as he had a goal and an assist in the losing effort but he has very little support these days. Pulock is 18-31-49 on the season which are pretty good numbers for a defenseman but his season looks like will end with either a first round exit or they just may fail to make the playoffs as the 9th seeded team Prince Albert is just 6 points behind the Wheat Kings. A quick note on the Victoria Royals as they are run by former Ranger assistant GM Cameron Hope and he has done a great job building a team that is on a 14 game unbeaten streak. The Royals are 3rd in the WHL's Western Conference and could surprise some people who are handing Portland and Kelowna the conference title. The team that knocked Brandon out of first place in the WHL's East Division the Regina Pats are led by Kyle Burroughs (NYI 2013 7th) and the Pats continued their own hot play with a 4-2 win over the Saskatoon Blades. The Pats after the win are unbeaten in their last 6 games as they are holding a 4 point lead over Swift Current. Burroughs was scoreless in the game. Then there is the battle going on between Adam Tambellini's (NYR 2013 3rd) Calgary Hitmen and Griffin Reinhart's (NYI 2012 1st) Edmonton Oil Kings. Right now Edmonton holds the edge with 3 games in hand as the 2 teams are tied with 86 points. Wednesday evening, it was Edmonton welcoming back Griffin Reinhart back into their lineup after missing 3 games as the Oil Kings took on the Red Deer Rebels. Edmonton won 4-1 as Reinhart was scoreless but the Oil Kings held the Rebels to just 15 shots for the entire game. It was a needed win because Tambellini and his Hitmen were winning their 8th straight game 6-4 over the Moose Jaw Warriors. It was a rare scoreless game for Tambellini. Ryan Graves (NYR 2013 4th) may not be a scorer but his physical presence on the Val-d'Or Foreurs blueline has been paying dividends since the Foreurs traded for Graves. Graves was a +1 on 2 shots but also had 4 hits as his Foreurs won their 6th straight after edging the Rouyn-Noranda Huskies 3-2. Graves also had minors for roughing and high sticking. The win allows the Foreurs to pull to within 1 point of Anthony Duclair's Quebec Remparts and Loic Leduc's (NYI 2012 4th) Rimouski Oceanic in the battle for the 4th seed in the QMJHL's playoffs. Graves and Leduc's Oceanic have been matching each other's wins as the Oceanic won their 6th straight game with a 9-3 spanking of the Sherbrooke Phoenix. Leduc was scoreless but added 2 hits as Rimouski and Val-d'Or are matching what the other team is doing with both teams 8-2 in their last 10 games. Finally Victor Crus Rydberg (NYI 2013 5th) was scoreless as his Plymouth Whalers defeated the Sault Ste. Marie Greyhounds 5-1 in OHL action. The Whalers are holding down 8th place in the OHL's Western Conference with a 5 point lead over Kitchener with 11 games left.